*This is a long overdue post that has been sitting as draft for a few months already. I just want to share this with you guys. Hope this is still helpful! My skin have been dry, flaky and irritated because of the cold holiday weather and also because of something I used last year. My skin broke out so bad that I have to use petroleum jelly just to appease the dryness and flaking. So I was in a hunt to find a new set of skincare products to heal and at the same time restore the moisture of my skin. I was always fascinated by the skincare regime of Koreans. They seem to always have a dewy and glowing skin. There are a lot of Korean brands that successfully have reached the Philippine shores to share to us the gift of beautiful skin. So I searched and looked for the best deal I could find among the Korean Skincare brands present in the country. In my search, I started with Eastwood City, a place that was just a stone throw away from home. It was Christmas time so skincare sets were in abundance as a gift option. I dropped by Tony Moly and instantly fell in love with their Love You So Much set. Aside from it's super affordable price, It has all the things my skin needs: a whitening cleanser, essence, a BB/CC/Foundation cream and lip and cheek tint. I asked a lot of questions to the friendly sales ladies at Tony Moly. I expressed my desire and hesitation to get the set. She recommended I get their Tony Moly Card for it has perks that could be useful. She also suggested some of their skincare items that was too irresistable. There were a lot items that I wanted to buy, but I was hesitant to splurge. So I just bought a simple brightening lotion to qualify for the Tony Moly Card. The moisturizer was more than Php500 so I was able to get some samples. I chose their best selling Tomatox mask and their new BB/CC cream. You can get 15% discount on any Tony Moly products every 15th of the month. Also if you purchase items 500 and above, you'll be getting sample sets of their products. I was elated to hear about those perks! I can get the Love you so Much set at a discounted price if I buy it on December 15th. After a few weeks of tossing and tumbling, I just couldn't resist and decided to buy the set even if it was before the 15th. Unfortunately, they ran out at Tony Moly Eastwood. I was frantic and begged the ladies there to call whichever branch has it. Luckily, Megamall branch still have that set so I rushed to Megamall to buy it. Days after Christmas, Tony Moly announced that they'll be having a 30%off sale on all items from December 26-30. I was like "OMG, I have to buy that Tony Moly Aloe Peeling Gel!" I was in a shopping frenzy that time. So I was able to sweet talk Soshi to buy some stuff as present for his cousins and sister at Tony Moly. It was Sale, he could save a lot of moolah plus and I know they will love it. (They are fans of K-Pop). 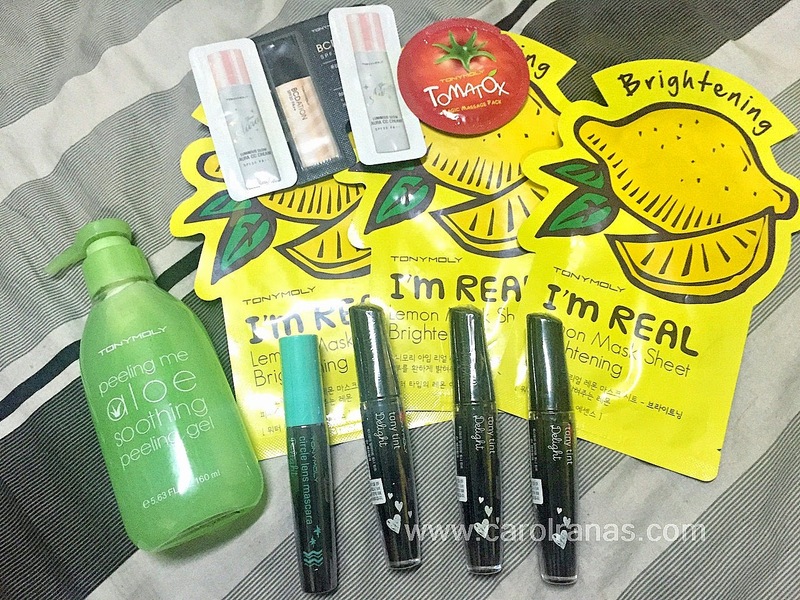 The sample, masks and lip and cheek tint are all given to Soshi's sister and cousins, while I was able to buy the Aloe Peeling Gel along with the Pang Pang mascara. It was a lot of items because I forced Soshi to close the total bill to Php1500 so I could get three sample sets to include as gifts. 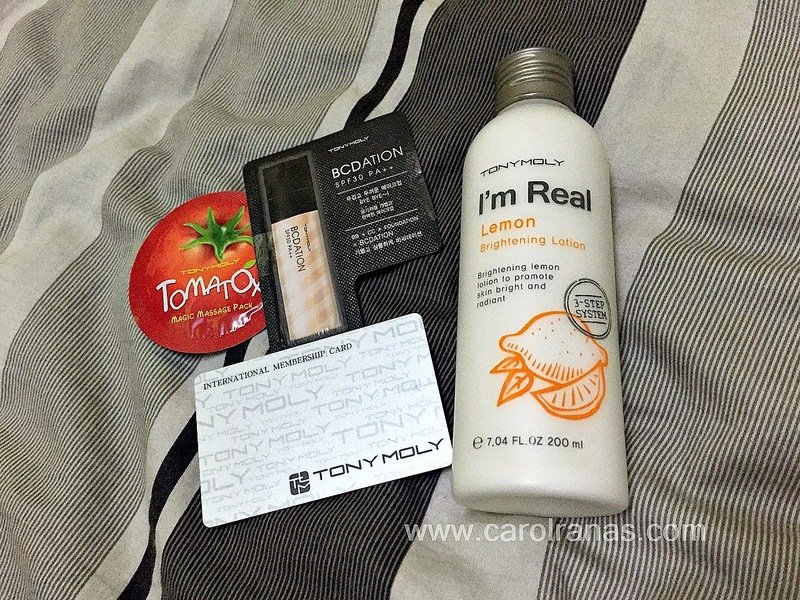 I instantly become a fan of Tony Moly for I was able to get the items I liked at an affordable price. Skincare is an important aspect for me, so I try to invest in good (but affordable) products. I'll be using the Tony Moly Card from time to time because I can save extra money when using it. I've been using the Tony Moly Floria Brightening Foam Cleanser, I'm Real Brightening Lotion, Darling Lip and Cheek Tint and the BCDAtion sample set for more than three months now. I'll do a review on a separate post for these products. I have a lot of products to try, I can't wait to share with you guys! This is my road to Beauty Blogging.. Yay! What does it take to be a Beauty Blogger? If you have any suggestions or tips on how to make my beauty post a lot better, feel free to leave it below. It will be very helpful for my future beauty posts!